We hope you'll join us for what promises to be a spectacular SABR 49 convention this summer in San Diego. Conference and hotel registration is now available at SABR.org/convention. Click here for more information on the SABR 49 All-Inclusive Package, Early-Bird Registration, and optional sessions. Click here to register for SABR 49. 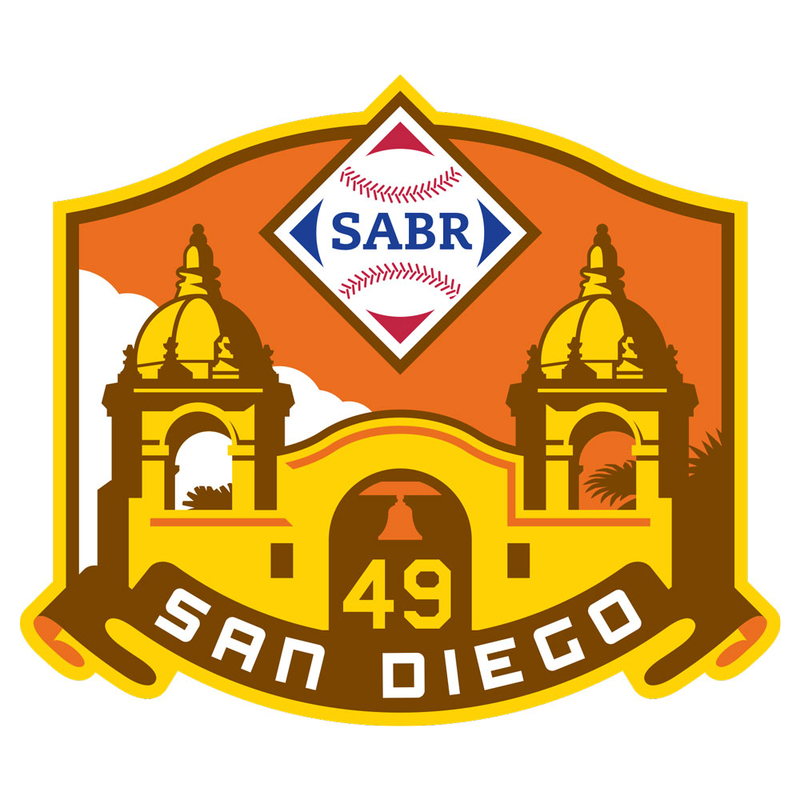 Our special SABR 49 convention logo, by acclaimed designer and longtime SABR member Todd Radom, invokes the historic Mission-style architecture found throughout the San Diego area and celebrates the 50th anniversary of the Padres as a major-league team. Anyone who registers for the SABR 49 all-inclusive package will receive an exclusive lapel pin with the SABR 49 convention logo, along with a ticket to the Padres vs. Cardinals game on June 28, a ticket to the SABR 49 Awards Luncheon, and two complimentary Continental breakfasts on Thursday and Friday mornings. *The Continental breakfast benefit is only available when you register for the All-Inclusive Package. Non-members can pay $399 for the All-Inclusive Package; the deadline to register is Monday, May 6, 2019. Hotel: The special SABR group rate at the Manchester Grand Hyatt in San Diego of $224/night (single rate) or $254/night (double rate) is only available to registered convention attendees. After you register for the SABR 49 convention, you will receive an e-mail confirmation with details on how to book your hotel room at the SABR group rate. If you do not receive your confirmation email after registering, please contact Deb Jayne at djayne@sabr.org. There are a limited number of rooms in our group block, so be sure to register for SABR 49 early! Awards Luncheon: SABR will host a special Awards Luncheon on Friday, June 28 at the Manchester Grand Hyatt in San Diego. The Awards Luncheon, which includes a meal, will feature the announcement of SABR's annual awards — including the Bob Davids Award, our highest honor. One ticket to the Awards Luncheon is included in the all-inclusive package or guest tickets are available for $70 when you register for SABR 49. Research presentations: SABR invites all members to present their research findings to their colleagues attending SABR 49. The deadline to submit your abstract is Sunday, February 24, 2019. Click here for complete details and application form. 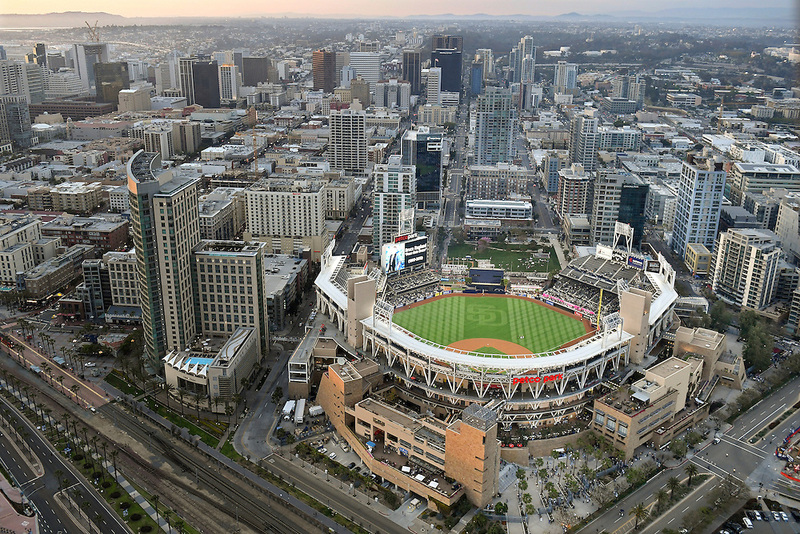 Yoseloff Scholarship: Students, click here to learn more about a Yoseloff Scholarship to attend SABR 49 in San Diego. The deadline to apply is Friday, March 29, 2019. Visit SABR.org/convention to learn more. 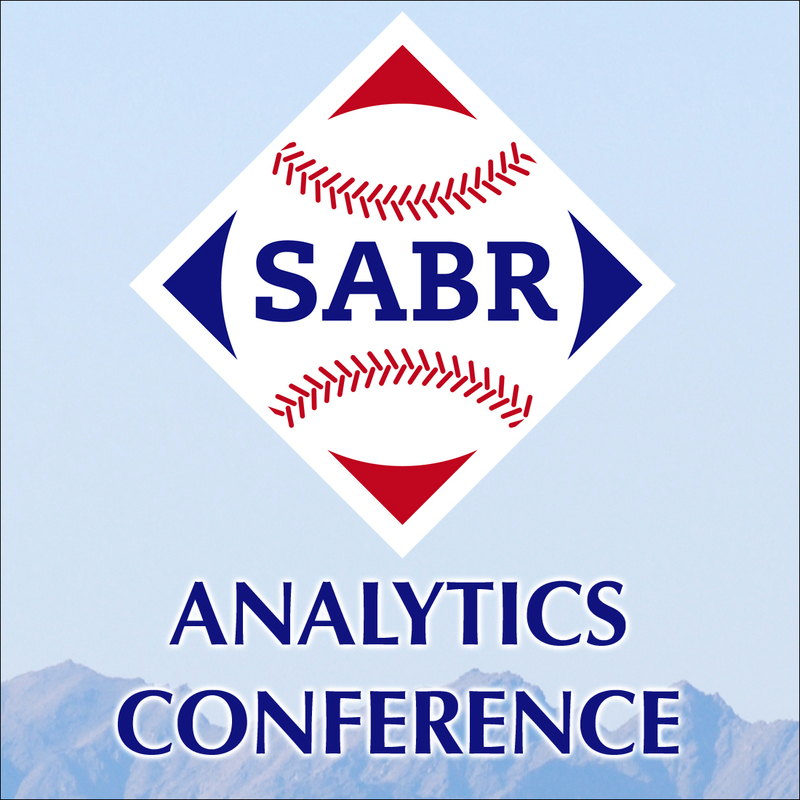 Join us for the eighth annual SABR Analytics Conference on Friday, March 8 to Sunday, March 10, 2019, at the Hyatt Regency Phoenix, where we'll bring together the top minds in the baseball analytics community to discuss, debate and share insightful ways to analyze and examine the great game of baseball. All baseball fans are welcome to attend. Register today to join us! Registration: Click here to register for the 2019 SABR Analytics Conference; SABR members: $445 regular registration (until February 14, 2019); $595 afterward. Students: $350; includes one-year membership to SABR. Hotel: Click here to book your room at the Hyatt Regency Phoenix at the special SABR rate of $229/night (plus tax). Please note: Rooms are also available under the SABR group block for the nights of Wednesday, March 6; Thursday, March 7; and Sunday, March 10. If you are visiting Arizona for spring training, please contact Deb Jayne to check on availability. Yoseloff Scholarship: Click here to learn more about the Yoseloff Scholarship to attend the 2019 SABR Analytics Conference. Research Awards: Stay tuned for more news on the 2019 SABR Analytics Conference Research Awards. Click here for more information. Research presentations: Stay tuned for more news on 2019 SABR Analytics Conference research presentations. Click here to learn more about submitting an abstract. SABR invites all members to present their research findings to their colleagues attending SABR 49, the 2019 annual convention in San Diego. Through on-site judging, the most highly-regarded presentations will receive the Doug Pappas Award for best oral presentation and the SABR Convention Poster Presentation Award for best poster presentation. The submission deadline for SABR 49 abstracts is midnight PST on Sunday, February 24, 2019. Click here for complete details and submission criteria. With generous funding from The Anthony A. Yoseloff Foundation, Inc., SABR will award up to four scholarships to high school or college students to attend SABR 49 on June 26-30, 2019, in San Diego. This scholarship will pay for registration, transportation and lodging (double occupancy) up to a total value of $1,250. The objective of this scholarship fund is to encourage high school and college-level student engagement with baseball research and to engender an active interest in baseball and SABR. All applications must be postmarked or e-mailed to Jeff Schatzki at jschatzki@sabr.org no later than Friday, March 29, 2019. 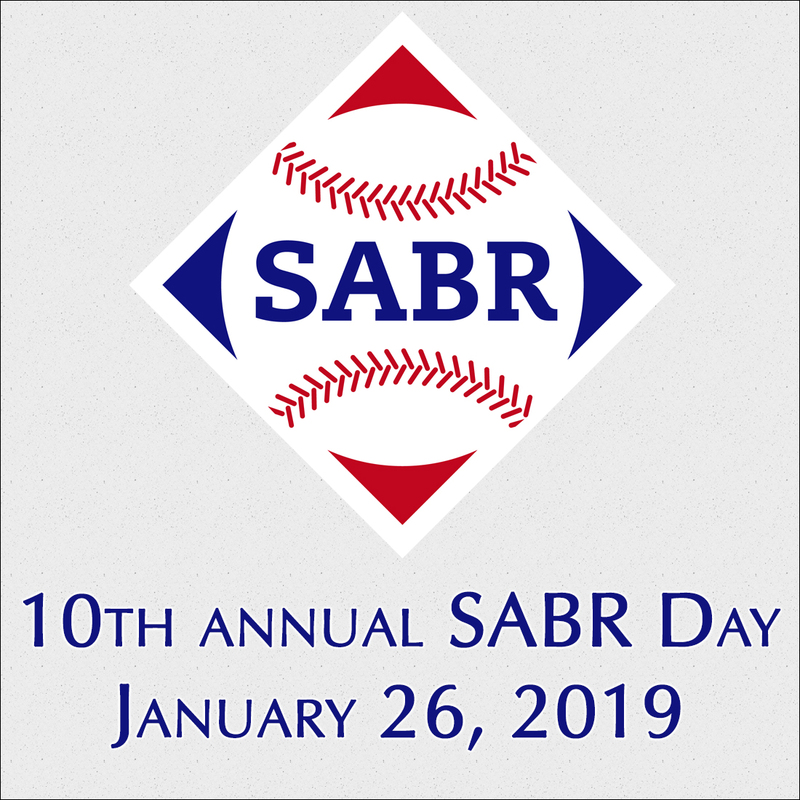 The 10th annual SABR Day will be held Saturday, January 26, 2019. More than 40 meetings are scheduled for SABR Day around the globe. Regional SABR meetings are open to all baseball fans and are usually free to attend, so bring a friend! Guest speakers often include current and former baseball players, managers, umpires, executives, scouts, writers and authors. Check out SABR.org/sabrday for more information on a SABR Day meeting close to you. Chapter leaders, please be sure to send any details on your SABR meeting to Jacob Pomrenke at jpomrenke@sabr.org so we can update our SABR Day map. On Saturday, January 19, the Pee Wee Reese Chapter will be holding its annual SABR Day meeting from 10:00 AM to 1:00 PM at Louisville Slugger Museum & Factory in Louisville, Kentucky. Guest speakers include Doug Wilson, author of Let's Play Two: The Life and Times of Ernie Banks; Cory Ritterbusch and Glen Sparks with presentations on the chapter's namesake, Hall of Fame shortstop Pee Wee Reese; Harry Rothgerber on the history of SABR in Kentucky; plus a trivia contest, door prizes, and more. Click here for more details. On Saturday, January 19, the Oklahoma Chapter will gather for SABR Day from 1:30-3:30 p.m. in the Gaylord College building, Room 3160, on the University of Oklahoma campus in Norman, Oklahoma. Our program will include a panel on Minor League Baseball with former Durham Bulls executive Glenn Leshner, Oklahoma City Dodgers media relations executive Lisa Johnson, broadcaster Jim Byers, and Seamheads.com writer and statistical guru Kevin Johnson. We'll also have presentations on old-time baseball cards with Jesse Asbury III and OU reporter Collin Kennedy on his 2018 College World Series trip. Click here for more details. On Sunday, January 20, the Baltimore Babe Ruth Chapter will hold its fourth annual meeting for SABR Day from 10:00 a.m. to 4:00 p.m. at the Peabody Heights Brewery in Baltimore, Maryland. 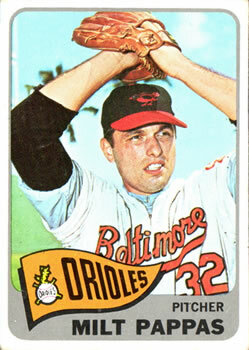 Guest speakers include former Orioles Ron Hansen and Larry Haney; Jane Leavy, author of The Big Fella; SABR Treasurer F.X. Flinn; past SABR president and former "bodyguard to the stars" Cappy Gagnon; Warren Grill, former Washington Nationals team chef; plus research presentations by Charlie Vascellaro, John Burbridge, Ken Mars, and Dave Stinson. Admission: $39 per person, including lunch catered by Mission Barbeque. Click here for more details. On Monday, January 21, the Boston Chapter will hold its annual MLK Day meeting from 11:30 a.m. to 3:30 p.m. at GameOn at Fenway Park. Former Red Sox manager Joe Morgan and Boston College coach Mike Gambino are among the guests, with a whole program of baseball-related themes on the docket. Presentations will also be made by SABR members Bill Nowlin, Saul Wisnia, Bill Ballou, Gordon Edes, and other special guests. Admission: $25 for SABR members, $30 for the general public. Lunch is included in the admission price. Register online in advance at Eventbrite.com. Click here for more details. To learn more about upcoming SABR events, visit SABR.org/events. 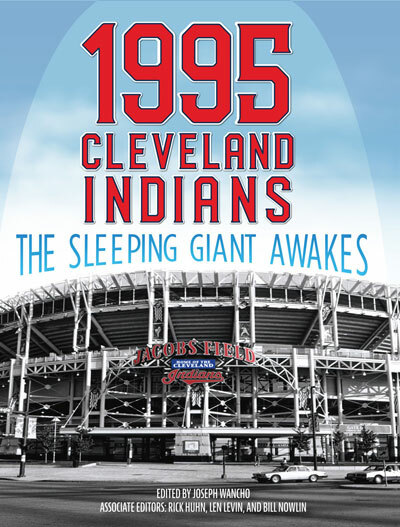 410 pages, 8.5" x 11"
After almost 40 years of sub-500 baseball, the Sleeping Giant woke in 1995, the first season the Indians spent in their new home of Jacobs Field. The Indians ruled Cleveland from 1994 through 2001, winning two pennants and making five playoff appearances. In 1995, the Cleveland Browns had left town and were putting down roots in Baltimore. The Cleveland Cavaliers, while competitive, were usually ousted in the first round of the NBA playoffs. The Indians were the best ticket in town, and 455 consecutive sellouts — from June 12, 1995 through April 2, 2001 — are a testament to their popularity. While the Indians made it to the brink of baseball nirvana in both 1997 and 2016, losing in Game Seven of both those World Series, it is the 1995 team that fans remember the most fondly. Perhaps this is because they were the first to break through since 1954 and make the postseason. Maybe it’s because of the different characters and personalities who made up that team, which included Jim Thome, Eddie Murray, Manny Ramirez, Kenny Lofton, Orel Hershiser, and Sandy Alomar Jr. They had an All-Star seemingly at every position. As you leaf through the pages of this book, presented here by 40 SABR authors and editors, you will be transported back in time to 1995. The biographies of all the players, coaches, and broadcasters will evoke that glorious era once again for Tribe fans. The volume is also sprinkled with personal perspectives, as well as game stores from key matchups during the 1995 season, information about Jacobs Field, and other writing of interest on the historic season. Contributors include: Rick Balazs, Richard Bogovich, Augusto Cárdenas, Alan Cohen, Philip A. Cola, Rory Costello, Richard Cuicchi, Charles F. Faber, Dan Fields, Chip Greene, Edward Gruver, Mark Hodermarsky, Paul Hofmann, Rick Huhn, Jay Hurd, Jimmy Keenan, Ted Leavengood, Bob LeMoine, Len Levin, Stephanie Liscio, Gary Livacari, John McMurray, Jeanne M. Mallett, Wynn Montgomery, Bill Nowlin, Gregg Omoth, Anna Pohlod, Joel Rippel, Kelly Boyer Sagert, Rick Schabowski, Harry Schoger, Blake W. Sherry, David E. Skelton, Doug Skipper, Mark S. Sternman, Andy Sturgill, Clayton Trutor, Nick Waddell, Joseph Wancho, Tom Wancho, Steve West, Christopher Williamson, and Gregory H. Wolf. E-book: Click here to download the e-book version of 1995 Cleveland Indians for FREE from the SABR Store. Available in PDF, Kindle/MOBI and EPUB formats. 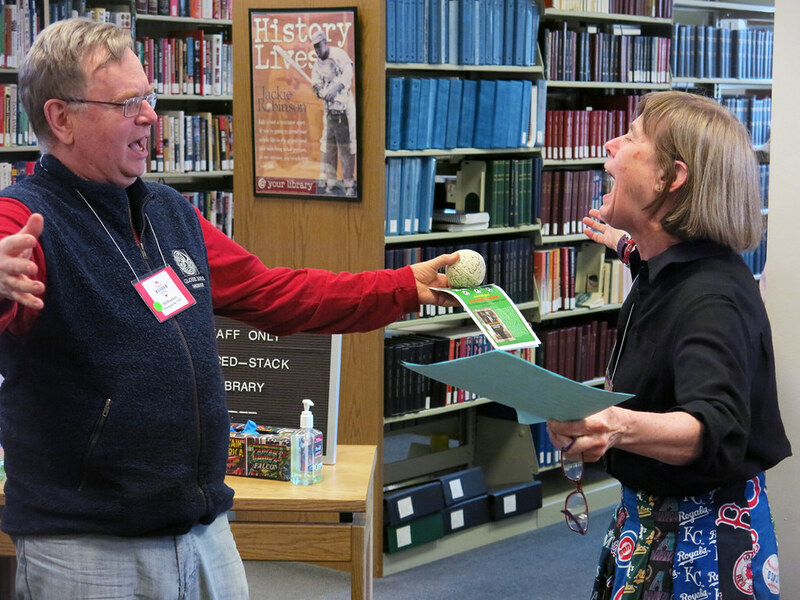 The 11th annual Frederick Ivor-Campbell 19th Century Base Ball Conference will be held April 26-27, 2019, at the Baseball Hall of Fame in Cooperstown, New York. Note: Space is extremely limited and some research presentations will be double-tracked. On the final page of your registration form, please indicate your preferred choice of Research Presentation for each of the six pairs that are double-tracked. Registration: Click here to download the registration form (PDF). Registrations can be accepted by mail only: send BOTH completed 19th Century Base Ball Conference registration forms to: Peter Mancuso, 6970 Ely Road, New Hope, PA 18938. Enclose your personal check for the appropriate amount and make payable to “SABR,” with “Fred 19cBB Conference" written on the check’s memo line. Cost: Conference registration is $65 per person, including the Saturday luncheon. Tickets for the optional Friday evening Welcoming Dinner ($45) at Templeton Hall and Saturday evening Post-Conference Gathering ($35) at the historic Otesaga Hotel can also be purchased in advance for you or a guest. Anyone who wishes to purchase an extra ticket for a guest to attend the Saturday luncheon only ($35) can also do so. RSVP: Please mail your registration form no later than February 6. Registration is limited to the first 80 people to sign up, so please register early! Contact: For questions, or if you miss the registration mailing deadline, contact Peter Mancuso at peterplus4@earthlink.net to see if space is still available. The 2019 conference will be highlighted by a keynote address from baseball historian Joanne Hulbert, along with a panel discussion on “The Birth of Baseball Cards” with John Thorn, Peter Devereaux, Tom Shieber, and Jeff Katz; a special presentation by Richard Hershberger on "The Evolution of Baseball Rules"; a Member Spotlight interview of Priscilla Astifan by Bob Bailey; plus book signings, research presentations, and a welcome dinner. For more information, or to register, visit SABR.org/ivor-campbell19c. 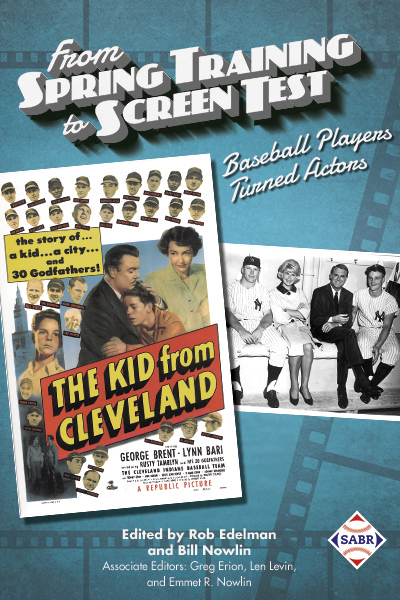 Click here to download a free e-book edition or get 50% off the paperback edition of From Spring Training to Screen Test. To find all titles in the SABR Digital Library, visit SABR.org/ebooks. October 7, 2015: Pirates lose to Cubs, Arrieta in National League Wild Card Game, by Thomas J. Brown Jr.
April 26, 2016: Pirates' Andrew McCutchen hits three home runs at Coors Field, by Thomas J. Brown Jr.
September 29, 2018: David Wright plays his final game with Mets, by Thomas J. Brown Jr.
Read all stories from Sportsman's Park in St. Louis online: In Sportsman's Park in St. Louis: Home of the Browns and Cardinals at Grand and Dodier, edited by Gregory H. Wolf and published by SABR in 2017, we shared stories of 100 memorable games at the venerable ballpark which played host to the St. Louis Cardinals and Browns from 1909 through 1966. From Babe Ruth's 3-homer World Series day to one-armed outfielder Pete Gray's major-league debut to Eddie Gaedel's pinch-hitting appearance to Bob Gibson's Game 7 heroics, you can now find all game stories from the Sportsman's Park in St. Louis book online at the SABR Games Project. Click here to read them all. Or click here to download a free e-book copy or get 50% off the paperback edition. This week's guests are SABR member Jay Jaffe of FanGraphs and Jared Wyllys of Forbes. You can also listen to archives of recent episodes on-demand on the SiriusXM Internet Radio App. Click here to learn more. 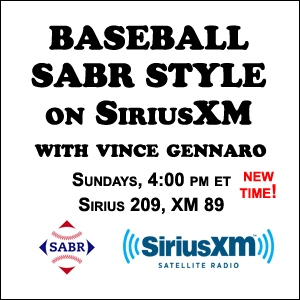 Behind the Numbers: Baseball SABR Style on SiriusXM focuses on examining and interpreting the statistical analysis that plays a critical role in baseball today. It airs weekly throughout the year on MLB Network Radio, available to subscribers nationwide on XM channel 89, Sirius channel 209, and on the SiriusXM Internet Radio App. SABR Day is coming soon! Chapter leaders, please be sure to send any details on your SABR Day meeting to Jacob Pomrenke at jpomrenke@sabr.org so we can update our interactive map at SABR.org/sabrday. This page was last updated January 18, 2019 at 1:57 pm MST.